inexpensive, but a great value!!! Easy to set up, multiple input selections. It will play mp4 files from a flash drive easily. It also has jpg ability, so you could do a slideshow of images. I thought I'd need more room, but with only approx 10 feet from the projector to the screen produces an image almost 9 feet wide and 5 or 6 feet tall. In a dark room the image is very bright and viewable. The remote takes a bit of getting used to, but once you get the hang of it is a snap. For the sound, I use a soundbar I have behind the screen, but you can hook up any sound system you'd like. Not noted in the original description for this is there a screwhole mount on the bottom, so you can screw it onto a tripod or a homemade stand, for more stability and adjusting. It's very silent, and in fact I didn't really notice any sound coming from it. You can't go wrong with this purchase, and I'm glad I got it! This LCD video projector really meets my needs when I want to watch a movie overnight. It's better than the traditional projector that i used to own that required a incandescent light bulb, and the brightness requires a very very dark room to watch. 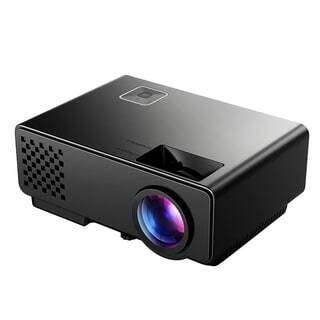 This projector solved my brightness and sharpness issues, and the best thing about this projector that I get watch online cat and dog videos on the wall. It has enough features that I need and what i also need in the future. I do recommend this projector for family movie presentations, and also to get that real home theater experience! Absolutely love this projector. I bought it for our home theater and it delivered a stunning picture after minimal set up--less than 10 minutes from out of the box to showtime! My only complaint is that the speaker doesn't provide good sound from a DVD, so we had to supply a better one in order to truly enjoy a cinematic experience. I received this projector very promptly and tried it out immediately. The image is clear even in a semi-lit room. We love this! We're using it for an outdoor theater (stored indoors in a case when not in use). Works great and you can't beat the price. Hooks up fine with HDMI/USB cables. Small light weight compact unit. Easy to place anywhere out of the way to use. Easy to use unit everything is labeled. Excellent picture for games and easy to focus. its better in a dark area, but then I bought it for the price and it will be used for outside this spring and summer. easy to use!! What a fun purchase for our family! We’re able to watch our favorite shows anywhere - anytime! He picture quality is excellent! Good value for the price! This is a nice projector the directions leave a lot to be desired but you tube got us operational. Works great! Family movie night in our back yards. Very small and compact just the right size for us. Work great for 3 months then the light out periodically. Have to let it sit for 1 hour then turn back on. I bought this on a whim and really wished i had returned it. The room needs to be near pitch black in order to see the picture. I can't really use it outside even, because the moon and the stars drown it out.